If you're looking for a book to help you jump directly into Orchestrator, this is a great resource. It breaks various tasks into "recipes" (chapters) that are roughly 5-10 pages each. Some chapters build on each other, but after a few initial sections focusing on installation and basic configuration, you're pretty free to flip through and experiment instead of working sequentially, if that's your thing. There are chapters on creating Orchestrator runbooks for each of the System Center products as well as Active Directory. It cover the most frequently used Orchestrator activities for each product and most of the runbooks that you create are actually useful. In a production environment, you'll want to add in error handling and some more complicated logic in most places, but it gives you a solid foundation to build on. What this book isn't going to do is cover the internals of what Orchestrator is doing under the hood. 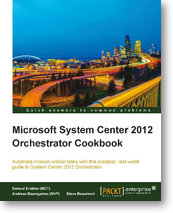 It doesn't cover how you should architect Orchestrator, though it does have a chapter for a multi-server install. It's very focused on giving the reader digestible chunks that can be done in a test lab in 15 minute bursts. Even though this is for Orchestrator 2012, it's also applicable to 2012 R2. Very little has changed between the two versions, so if you're on the fence about whether or not this is still applicable - it is.